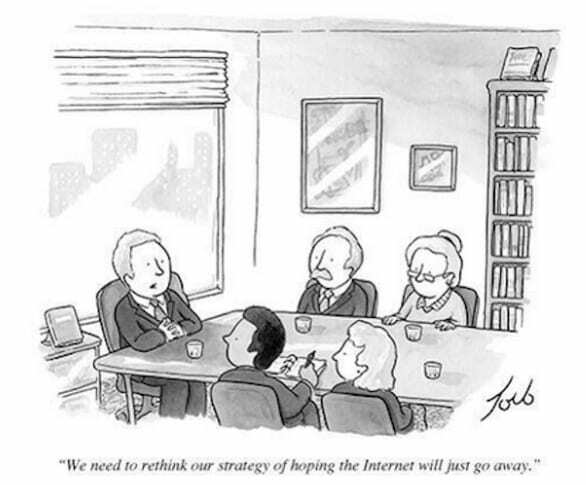 I found this cartoon a while ago and it perfectly resonated with some of the conversations I’ve had with people about how they are, or aren’t!, coping with life in the digital world. The plain fact is that “digital” is here to stay, it is all around us and it is how much of the information we deal with on an everyday basis is created, captured, stored, manipulated and presented. In February I conducted two “Digital Savvy” workshops in London in partnership with NPC as a contribution to their Digital Transformation programme. This is also as a part of promoting Web Science beyond the academic and government communities, and in to the Not-for-Profit/Charity and Philanthropic sectors. Becoming “digitally savvy” is a necessary skill for people in all types of organisations, and I believe it is absolutely crucial that as many people as possible have at least a basic understanding of how data and digital work. To enable and empower citizens/consumers/constituents and customers. To create whole new ways to define, measure and manage “impact”, however it is determined. When asking people how they found the UK workshops (the content of which can be found here) two comments are worth citing. A brain-stretching wake up call on the reality of digital age. Both reinforce (for me) the need to provide a safe and non-judgmental learning space within which to demystify some of the fundamentals of the digital world; to explain how it works in the simplest of terms; and to let people play with digital tools and ask the “dumb questions” (which we all have!). Coupled with this is the importance of providing people with some time to reflect upon their own digital interactions, online behaviours and social relationships. From my point of view what I notice is that regardless of the context and environment the conversation is now moving away from the technology and towards the human side – it is becoming a conversation about what sort of world we want to live in, and what sort of beings we want to become. It is about the Social Machine as an ethical and moral concept embedded within the broader socio-political and socio-economic context. As people begin to realise this I notice that they are becoming more empowered to have an opinion and to voice their concerns and questions. However, we need leaders from all walks of life to step up and take the responsibility to educate themselves, to not get caught up in the almost daily announcements of new technology breakthroughs, but to take a step back and see the bigger picture. The workshops we are conducting are our small part in trying to help people do this, and from their own education to take that to the organisations of which they are a part. Following on from the pilots we conducted last year our first 2016 Australian workshop will be held next Friday, 18th March, 2016, courtesy of James Willis and Total Clarity Group. We have a small group of brave individuals who are willing to play “igoramus” for a day and give us some feedback about how we can make sure that workshops give people at least some of the basics that are becoming mandatory to navigate and negotiate the digital world. If you are interested in finding out more then please contact me. A one day hands on workshop which demystifies the digital world and enables participants to understand their own digital presence, impact and responsibilities. Thinking ‘digitally’ is something that we all need to learn to do, because unless you are completely disconnected from the internet and digital media, it is how we now navigate much of modern world. Digital thinking is a literacy, as is writing, reading and numeracy, and is the key to proactively managing all organisations—government, commercial and not for profit. This workshop will focus on the practical aspects of digital literacy, from the most basic including social media, to the more complex themes of artificial intelligence and their potential impact on modern society over the next decade. develop and articulate your own personal digital brand. Despite the fact that most people do already interact with digital technologies we assume no particular skills or expertise. All that we ask for is an open mind and the willingness to ask the seemingly ‘dumb questions’ and experiment by playing with the technologies in an open and collaborative environment. This workshop is aimed at you as an individual, regardless of the role you play in your organisation, but we aim to help you develop some tools that will help make you a better digital leader. There is no prior reading required, but we would like you to come along prepared to present your ‘digital profile’ to the group.